Does an Expensive TV Require an Expensive TV Mount? In today's world of ever-changing electronics, terms like 4K Ultra HD, Ultra Premium OLED, and LED/LCD Smart TV interface seem to be all the rage, but if you want to own one of the latest state-of-the-art televisions, it's going to cost you. These new technological wonders come in a variety of flat-panel and curved screen sizes and many come with a price tag in the thousands. Once your new TV arrives, you'll likely want to mount it on the wall to save space and provide easy viewing from every spot in the room. But, now that you've dipped a little deeper into your savings account than you originally planned, you're probably wondering, "Does an expensive TV require an expensive TV mount?" The simple answer is no, you don't need to spend a fortune on a TV mount or bracket. However, you do need a high quality mount to ensure your newest prized possession doesn't end up on the floor. There are three popular styles of TV mounts available - each is designed to hold a maximum weight and screen size. Each style also provides unique viewing capabilities, so you'll want to consider where it will be placed and how you'll be watching the TV before deciding which style is best for your needs. A fixed or low-profile mount is a simple metal frame that attaches to the wall. Your television will be hung flush to the wall at eye-level. This design is the least expensive of all the styles but is more than sufficient to secure your expensive television. It’s not adjustable, but rather provides a stable, permanent viewing position. A tilting mount is a popular choice, as it provides flexible positioning when you're unable to place your TV in the perfect location. This might be due to a poor furniture arrangement, windows or doors creating glare, or you may want to install it above a fireplace. This style is slightly more expensive and has a deeper profile, allowing you to tilt the television up and down to achieve the best viewing angles. A full-motion or swiveling mount is the ultimate in flexibility. It can tilt up and down and swivel up to 180-degrees in each direction, so you can sit in many different places and still get a great view of the screen. The good news is there will be no more fighting over the perfect spot on the sofa. The not-so-good news is that it protrudes away from the wall, and its complex design will add a little more to the cost. So how do you know if you’re getting a high-quality TV mount? All mounts are not created equal. Manufacturers’ specifications vary but the standard materials used are steel, aluminum, and plastic. While you might assume that steel would be the most durable to hold up to the weight of your expensive TV better than the others, there is another factor to consider. No matter what material is used, your mount should be quality-tested and be labeled with a UL rating. Other must-have features include standard mounting holes for a TV (it should be VESA-compliant) and also have a cable management system. No one wants to spend a lot of money on a state-of-the-art television only to see a maze of cables dangling below it. While you don’t need to spend a lot of money on your mount, understand that less expensive brackets will only come with basic clips to hold the wires while more costly units will have built-in channels to neatly run the cables through. You may be thinking, “I can install my own TV mounting bracket. How hard can it be?” and you might be right. But why not let our skilled Puls technicians take care of the heavy lifting for you? A Puls professional installation package includes everything you need including leveling, positioning for proper viewing height, affixing tightly to the studs, and even hidden cables and the complete hook-up of peripherals like TV sound bars, cable box, XBOX, home theater installation, and other device configurations. You can easily book a TV mounting appointment online, and our technicians can be there within the same day, at a time of your choosing, to make things an absolute breeze. 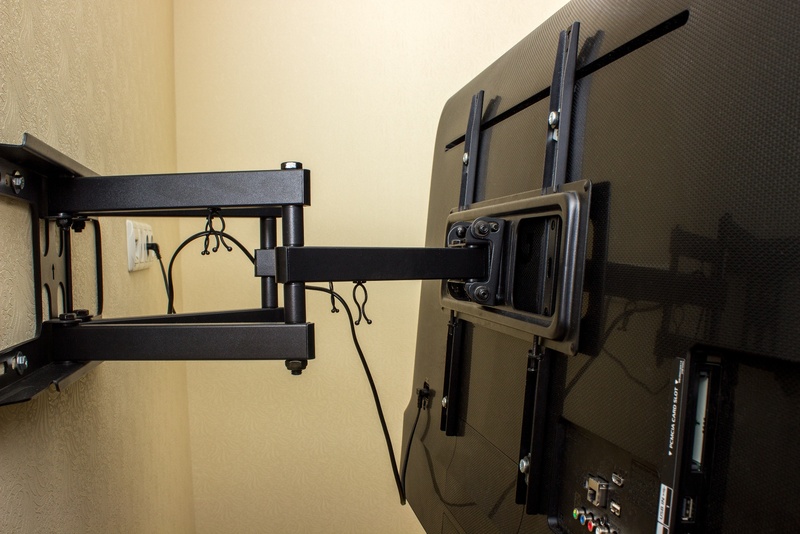 Simply select the type of TV mounting bracket you want and our expert will bring out the optimum size and style to securely fasten your valuable equipment to the wall. All work is back by a 90-day guarantee, so what are you waiting for? Book your Puls TV mounting appointment today, and get ready to sit back and enjoy your newly mounted TV for years to come.